Byulchunji is Open Books’ imprint for children’s literature. In Korean, “byulchunji” means “another world,” “a different world” or “a world apart.” The name represents Byulchunji’s dedication to opening a whole new world of books for young Korean readers and their parents to discover, enjoy and learn. This new imprint was launched in the summer of 2009 and already has a substantial and varied catalogue of foreign picture books and children’s literature from Europe and America (North and South). It includes notably Caldecott Medal recipients Jerry Pinkney (The Lion and the Mouse) and Erin & Philip Stead (A Sick Day for Amos McGee) as well as Ragazzi Award recipients Ajubel (Robinson Crusoe) and Jean-François Martin (Fables d’Esope). 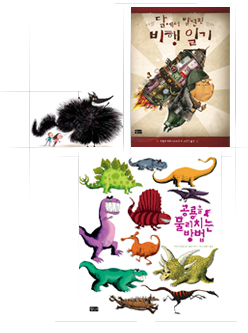 Among Byulchunji titles are also new editions of illustrated books by Korean authors and illustrators and works by Sempé and Gabrielle Vincent previously published by Open Books. For Bernard Werber’s youngest Korean fans, the Byulchunji list features an original comic book adaptation of his Nouvelle encyclopédie du savoir relatif et absolu by Korean comic manhwa artist Kim Su-bak.